Lots of themes played out this week, but in the end, it was the Loonie that reigned supreme. The Kiwi, meanwhile, found itself at the bottom of the forex heap. So what drove forex price action this week? Time to find out! Greenback pairs had roughly uniform price action this week, trading higher early on before tanking later. And this two-way price action, together with the Greenback’s mixed price action in the aftermath of the NFP report, is the reason why the Greenback had a mixed performance this week. The apparent trigger for the Greenback’s early rise was the CB consumer confidence index, since it improved from 120.7 to 122.9 in August, which is the second highest reading since 2000. The Greenback’s strength was then apparently sustained when the ADP report (237K vs. 185K expected, 201K previous) pointed to the possibility of a strong NFP report while the preliminary estimate for U.S. Q2 GDP growth was upgraded from +2.6% quarter-on-quarter annualized to +3.0%, which is the strongest quarterly rate of expansion in nine quarters. The year-on-year reading, meanwhile, was slightly upgraded from +2.1% to +2.2%, which is the strongest annual growth rate in seven quarters. Moving on, the Greenback kept on moving higher before finally starting to encounter selling pressure across the board during Thursday’s U.S. session. The Greenback did fall sharply when U.S. pending home sales disappointed (-0.8% vs. +0.4% expected, 1.3% previous). However, the Greenback was already on its way down before then, and the likely reason for the Greenback’s slide is profit-taking by Greenback bulls and preemptive positioning by Greenback shorts ahead of the NFP report. After all, as Forex Gump pointed out in his Event Preview, there has been a very strong historical tendency for the August NFP report to disappoint, and savvy market players were probably anticipating that. Anyhow, the August NFP report did disappoint as expected (156K vs. 180K expected), and so the Greenback tanked as a knee-jerk reaction. However, price action on the Greenback became mixed after that, with the Greenback continuing to bleed out a bit against the Aussie, the pound, and the Loonie while steadying or recovering against the rest. Looking at the details of the NFP report, everything was pretty much a disappointment. Average hourly earnings, in particular, only increased by 0.1% month-on-month, missing expectations for a 0.2% rise. The only real bright spot was that average hourly earnings maintained its 2.3% year-on-year pace of increase. But I doubt that would be enough to wash away the bitter aftertaste from the rest of the NFP report. Anyhow, no clear reason for this weird reaction to the NFP report, but I suspect the lack of follow-through selling on many Greenback pairs was due to selling pressure on EUR/USD, as well as profit-taking by those who shorted early when the Greenback began to dip ahead of the NFP report. After all, if the big players expect an NFP report to disappoint, can we really call the disappointment a surprise? Perhaps a sell the rumor, buy the news scenario played out? Well, whatever the case, the fact is that follow-through price action on the Greenback was mixed in the wake of the disappointing NFP report, which, to begin with, was already expected to disappoint. The euro’s price action this week was rather messy, with lots of diverging price action, which implies that opposing currencies dominated price action on euro pairs. As to why the euro was vulnerable to opposing currency price action this week, that’s likely because forex traders were hunkering down for next week’s ECB statement. Also, there were ECB-related rumors that had the net effect of blocking the euro from ending the week as a net winner. Speaking of the ECB statement and related rumors, the first rumor came from a Reuters report that cited “three sources familiar with discussions” over at the ECB. The other rumor, meanwhile, came from a Bloomberg report that cited unnamed “euro-area officials familiar with the matter” and was released shortly after the NFP report. Moreover, “it’s conceivable that the decision [to announce a tightening move] won’t be finalized until the Dec. 14 meeting.” according to these unnamed sources. And that’s obviously disappointing since expectations were high that the ECB would be doing that during the October meeting, with a slim possibility of doing that during next week’s ECB statement. Anyhow, these rumors are pointing to the possibility that the ECB statement will disappoint and there’s an even higher probability that the ECB will go out of its way to talk down the euro. In any case, things look interesting for the euro next week, so hopefully we’ll get more volatility and uniform directional movement. The pound had a good run this week. And while price action looks kinda messy, there’s actually some order in that chaos if we simply remove GBP/USD. As you can see above, most pound pairs harvested the bulk of their gains between Tuesday’s U.S. session and Thursday’s Asian session. So, what happened then, you ask? Juncker also said that “an enormous amount of issues … remain to be settled” during the course of the Brexit negotiation process. Moreover, Juncker reiterated the E.U.’s hard stance that establishing a trade deal should only happen after divorce proceedings are done. Okay, so if Brexit-related update were not very positive and economic reports were mixed and mid-tier at best, then what caused the pound to rally? Well, nobody really knows for sure. Many market analysts choose the easy route by ignoring the pound’s price action. But for those market analysts who at least try to add value to the discussion, the most common narrative is cautious dip-buying, given that the pound, at least on a trade-weighted basis, has become one of the most undervalued currencies. Other than that, market analysts also point to selling pressure on EUR/GBP after the currency pair reached an 11-month high, which then applied buying pressure on the pound in a general way and caused the pound to rise broadly. Well, whatever the cause may truly be, the fact still remains that the pound raked in most of its gains during that period. After that, however, the pound’s price action became rather messy, although buying pressure was still notable for the most part. Oh, also worth noting is that the pound did jump slightly higher on Friday, thanks to an upbeat manufacturing PMI report. However, follow-through price action became mixed because of the U.S. NFP report. Going back to the upbeat PMI report, the U.K.’s headline manufacturing PMI jumped from 55.3 to a four-month high of 56.9 in August instead of deteriorating to 55.0 as expected. Moreover, Markit noted that “All five of the PMI components – output, new orders, employment, suppliers’ delivery times and stocks of purchases” printed stronger readings in August, so the improvement was broad-based. Remember, weaker consumer spending has been the major reason as to why the U.K.’s GDP growth has slowed and growth prospects have soured. Markit’s findings and commentary are therefore signaling at a possible recovery in consumer spending. The new trading week started with an intense bout of risk aversion because of news that North Korea fired a ballistic missile that flew over Japan’s northern island of Hokkaido. Given the circumstances, the yen naturally didn’t look very attractive as a safe-haven currency, and so the Swissy became the safe-haven of choice, which gave the Swissy a very promising start. Unfortunately for the Swissy, it became clear that risk-taking was making a major comeback by the time Tuesday’s U.S. session rolled around, which also happens to be the beginning of the end for the Swissy’s bullish run. And for those interested, yes, the positive correlation between the Swissy and the euro held this week, which is probably why the Swissy’s price action become rather messy after the Swissy’s bullish run came to an end. The returning risk-on vibes gave the euro the upper hand against the Swissy, though. The yen was the second weakest currency of the week. And as usual, yen pairs were tracking bond yields. But as you probably saw in the chart above, the yen only had limited gains when very intense bond-buying caused bond yields to drop super hard during Monday’s late U.S. session and Tuesday’s early Asian session, very likely because the source of all that risk aversion was the news that North Korea fired a ballistic missile that flew over Japan’s northern island of Hokkaido. In other words, the close proximity of the source of risk aversion made the Japanese yen less attractive as a safe-haven and yen traders who were tracking bond yields were likely very wary of loading up on the yen, despite the drop in bond yields. The yen failed to take full advantage of the early drop in bond yields but it did take heavy losses when bond yields started to recover, especially during Tuesday’s U.S. session when risk sentiment recovered. And that’s why the poor yen was a net loser this week. 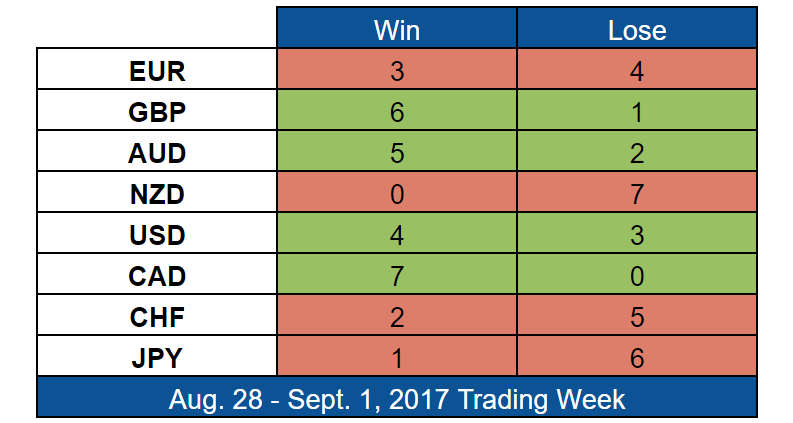 The Loonie scored yet another week of net gains and was even the best-performing currency of the week. This marks the third consecutive week of broad-based Loonie strength, with the Loonie in total control in two of those three weeks. Incidentally, the Loonie actually had a rough start and was initially one of the worst-performing currencies of the week, thanks Trump’s threats that he’d scrap NAFTA, as well as the early slide in oil prices because Hurricane Harvey disrupted several refineries in the U.S. Gulf Coast. The disruption, market analysts initially said, would be good for gasoline prices but bad for crude oil prices since the disruption would limit the supply of gasoline but would weaken the demand for crude oil and result in a buildup of U.S. oil inventories. And the weaker demand for crude oil will supposedly be greater than the expected disruption to crude oil supply. Fortunately for Loonie bears, the Loonie got a double boost come Thursday, thanks to the major recovery in oil prices and Canada’s Q2 GDP report. The recovery in oil prices was due to the news that the U.S. government was forced to use its strategic oil reserves for the first time in five years, which showed that the disruption to U.S. crude oil supply was actually bigger than expected. Also, there were news about falling oil production in Libya making the rounds at the time. As for Canada’s Q2 GDP report, it was really great because Canada’s GDP grew by 4.5% quarter-on-quarter annualized in Q2. This is much faster than the BOC’s forecasts of 3.0% and is the fastest quarterly growth since Q3 2011. In addition, Canada’s GDP grew by 3.7% year-on-year, which is also faster than the BOC’s forecast of 3.4%. Given all that, market analysts said that odds for another BOC rate hike this year got a major boost, with odds for a rate hike next week jumping from 20% to 37% shortly after the GDP report was released. And that, plus the good timing of the oil recovery, is the reason why the Loonie’s reaction to the GDP report was so strong. And expectations of a hawkish BOC statement next week (and a small chance for a rate hike) fueled demand for the Loonie until the week to a close. Again, another BOC statement is coming up next week, so make sure to keep an eye on the Loonie, since that top-tier event may give the Loonie another frisky week. Australia released some economic reports during the session, but they had only minimal direct impact on the Aussie’s price action. As usual, however, the Aussie was tracking iron ore for the most part. And since iron ore was higher for the week, the Aussie quite naturally had a good run this week as well. And according to market analysts, the iron ore rally this week was due to restocking of depleted iron ore supplies amid higher Chinese steel output and China’s improving industrial outlook. Aside from iron ore, risk sentiment also had an effect on the Aussie’s price action. During Tuesday’s Asian session, for example, iron held steady but the Aussie tanked when risk sentiment soured because of news that North Korea fired a ballistic missile that flew over Japan’s northern island of Hokkaido. Iron ore did drop later, but the Aussie recovered instead, apparently because risk sentiment also recovered amid easing jitters related to North Korea after Trump refrained from replying with another “fire and fury” message and chose to focus on the damage inflicted by Hurricane Harvey instead. The Kiwi got another good whupping this week. And as you can see in the overlay of Kiwi pairs above, the Kiwi had a choppy start but began tilting to the downside on Wednesday after RBNZ Governor Graeme Wheeler gave a speech. Moving on, the Kiwi had another tough time on Thursday when ANZ released its latest Business Outlook Survey since survey results showed that the percentage of optimistic businesses fell from 19.4% to 18.4%. This marks the second month of deteriorating results after peaking at 24.8%. Other details of the survey were a bit disappointing as well. The percentage of business that expected the RBNZ to hike within the next 12 months, for example, fell from 50.6% to just 39.9%. Inflation expectations also fell from 1.98% to 1.88%, which is why the pricing intentions fell from 27.6% to 20.5%. Anyhow, the Kiwi continued to slide after that without any other major catalysts, although price action did become a bit more mixed while still showing mostly weakness.